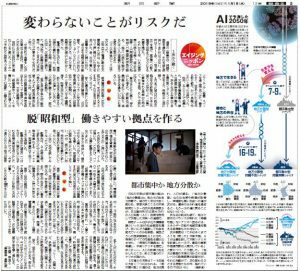 An AI-based simulation by Prof. Yoshinori Hiroi was featured on the front page of the 2019 New Year’s Day edition of the Asahi Shimbun Newspaper. The article was entitled, “A proposed scenario for AI in 2050 affecting individual lifestyles in the new era?” Concerning developing sustainability of the Japanese society, Prof. Hiroi discusses two scenarios: “concentrated populations within cities” and “dispersed populations in non-urban areas”. His project seeks to facilitate the materialization of the latter, more sustainable population distribution. Prof. Hiroi also touches on signs of new changes in how individuals live within new generations.